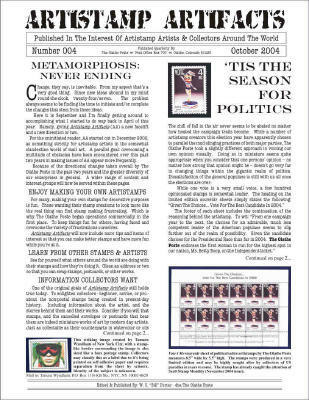 The October 2004 issue of Artistamp Artifacts is the first issue to change from it's former status as an occasionally issued mail art documentation zine, to a regularly published quarterly periodical. Artistamp Artifacts is published to assist stamp makers of all calibers with their hobby and to assist the collector of the alternative, artistamp artform (non-postage stamps) in knowing more about the art itself, the artists, and the resulting stamps in this fun, alternative form of stamp collecting. Tamara Wyndham (NYC), The Olathe Poste (CO), Pete Spence (AUS), Peter & Angela Kustermann (GER), Carla Cryptic (CA), Marta Belles (ESP). October 2004 issue: 8.5" x 11" format, 6 pages printed in full-color.